The French are famous for their flair. They seem to be able to add a touch of artistry to anything, no matter how challenging. 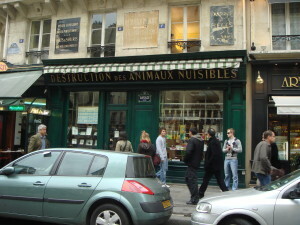 In the Rue Des Halles in Paris, Julien Aurouze runs a pest extermination business. Wiping out rats, mice, cockroaches and all the other vermin that haunt our houses is a ghastly, gruesome job. These repulsive pests hardly bear thinking about, let alone looking at. 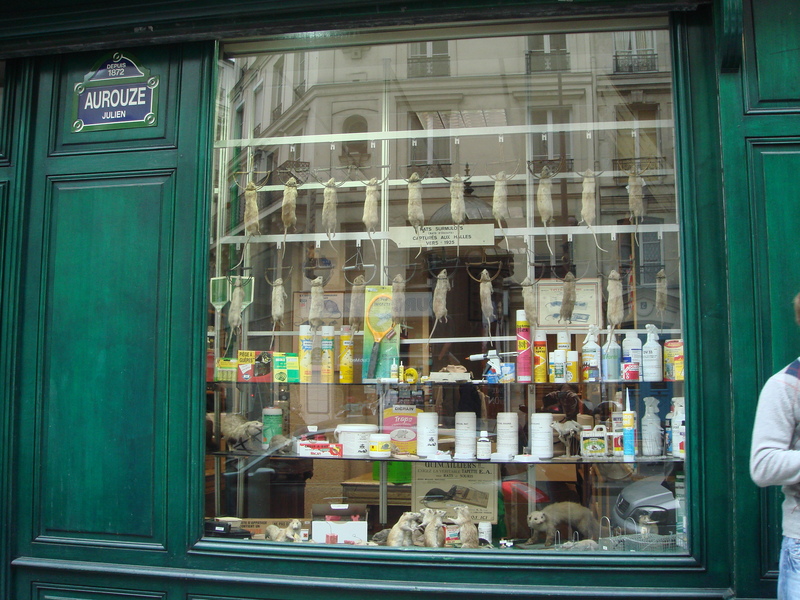 Yet, in Julien Aurouze’s shop window rodents and insects are arranged with such artistry and flair that they’re compelling and even in a strange, ghoulish kind of way, pretty. Julien Aurouze’s Destruction des Animaux Nuisibles in Rue Des Halles are indeed proof that the French can add flair and artistry to anything. La Tour Eiffel is one of the world’s great towers and certainly the most powerful symbol of France. 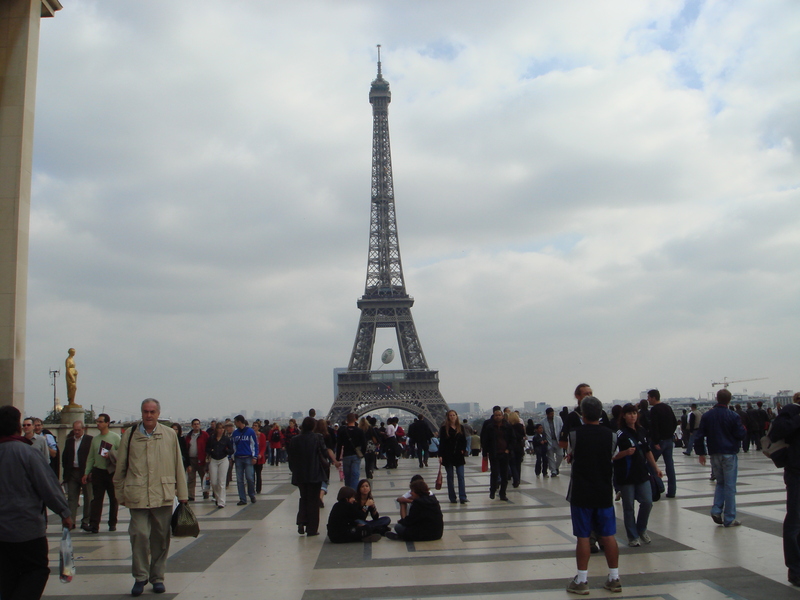 Although by modern standards, it’s relatively small structure, the Eiffel Tower dominates both the Paris skyline and the Parisian consciousness. A view of the Eiffel tower is one of the most coveted in the city. For the visitor, that first glimpse of the Eiffel Tower says “I’m in Paris, I’ve really arrived”. Originally, the Eiffel Tower was intended as a temporary installation, for the duration of the Exhibition only. When it was announced that the tower would remain, there was vociferous division among the people of Paris. Some deplored it as an eyesore. Others hailed it as a masterpiece. The Eiffel Tower however, remained. The Eiffel Tower soon became part of the Paris story. It has seen many celebrations; the centenary of the French Revolution, the end of World War I and II, the turn of the 21st century, countless Bastille days and marked innumerable French sporting moments. Whatever the occasion, La Tour Eiffel will be found, dressed to perfection for it! La Tour Eiffel has seen hundreds of stunts; fly-overs, fly unders, parachute jumps and bungy jumps. It has also seen its share of romantic moments and I imagine that the marriage proposal I witnessed when I was last there was one of many. 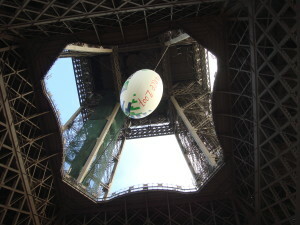 Ascending the Eiffel Tower is a tourism imperative, whether in its crowded, creaking lifts, or on its winding stairs. The view from the top is breathtaking! Undoubtedly the most luxurious way to enjoy the view from the top of the Eiffel Tower is from a window able in the famous Jules Verne Restaurant. Overlooking the Seine on the Quai de la Tournelle, in the 5th Arrondissement of Paris, is La Tour D’Argent, the city’s, if not the world’s, oldest fine dining restaurant. It opened its doors for the first time in 1582 and, apart from the four years of World War I, has not closed them since. 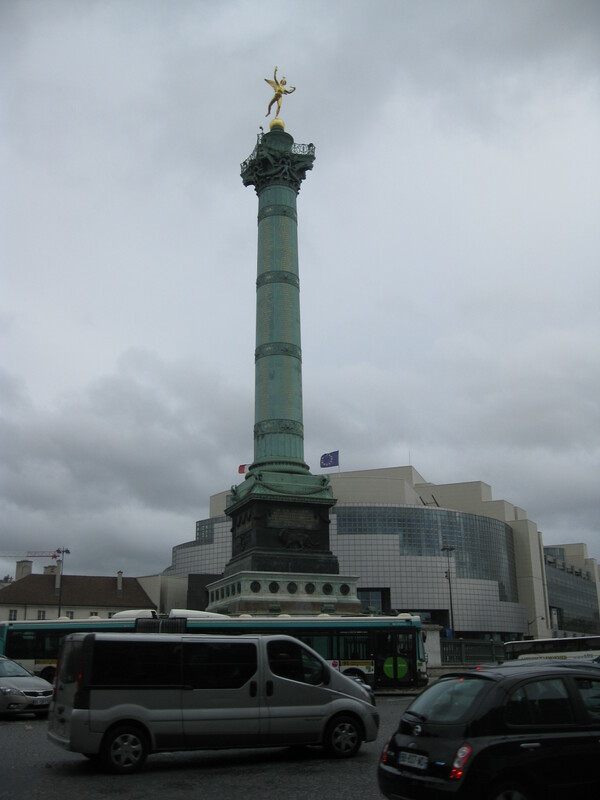 La Tour D’Argent takes its name (silver tower in English) from the light grey stone of the Champagne in which it is constructed. Little is known of its first decades but by the 1600’s La Tour d’Argent had become the most desirable restaurant in Paris. Duels were fought by patrons desperate to secure tables! The centuries have not diminished its reputation or its popularity and prospective diners will often wait months or even years for place – unless of course they happen to be celebrities! La Tour d’Argent has always been the haunt of the rich and famous. Henri IV ate in and also out, ordering slices of Heron Paté delivered to his palace. King Louis XIV and his courtiers from the Château de Versailles dined at La Tour D’Argent. Le Duc de Richelieu treated his guests to a whole ox prepared and served in over 30 ways. When theatre suppers were introduced in 1720, Philippe D’Orleans, began to frequent the restaurant always in the company of a different Parisian beauty During the Second Empire Le Duc de Morny entertained here. The Countess Le Hon held assignations at La Tour D’Argent and once had to be disguised as a pastry cook to avoid being discovered by her husband. Since then Statesmen, Royals, Rock stars and Millionaires have graced its tables. Just as famous Canard au sang itself is the ritual now attached to it. It originated in the 19th century when the then owner, Frederic Delair decided that every duck prepared at La Tour D’Argent should be numbered. In 1890 Edward VII Prince of Wales ate number 328 and in 1921 Thomas Rockefeller devoured number 51,327, number 100,000 was sacrificed on the 6th May 1929 to an anonymous appetite, number. 500,000 was launched from the roof with a tag on its leg that offered the finder dinner for two. Roman Polanski enjoyed number 554, 711 in 1979 and more recently Bill Gates consumed number 1079006. The millionth duck was eaten in 2003. The count continues! 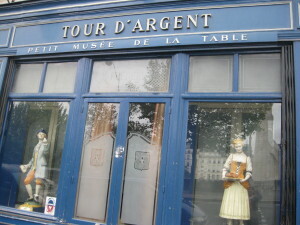 In 1910 Andre Terrail purchased the Tour d’Argent from Frederic Delair. He modernised the interior and the facade and in 1936 he added a sixth floor to give his patrons an even better view of the Bateaux Mouches and the barges on the Seine. He also added to its menu. Most importantly, he established Tour D’Argent’s legendary collection of fine wines. 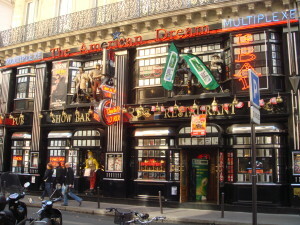 During World War I, La Tour D’Argent closed its doors for the first and only time in its long life. Although it remained open during World War II, it cellar was sealed shut to protect the precious wine collection. In 1947 the restaurant passed to Andre Terrail’s son Claude. Although his dream had been to become an actor he accepted his destiny at La Tour D’Argent “I’ve been chained to this ‘Tower’ since I was born” he claimed. Under Claude Terail the legacy of the Tour d’Argent continued, so did expansion, not just of the restaurant but of the “brand”! In1953 Le Petit Musée de la Table, a museum of gastronomy and also a pleasant spot for a pre-dinner aperitif, was established on the ground floor of the building. Four grand receptions marked the 400th anniversary of the restaurant in 1982 and in 1984 La Tour D’Argent, Tokyo opened in the New Otani Hotel. In 1985, Les Comptoirs de la Tour d’Argent, a boutique dedicated to the Arts of the Table and Gastronomy, opened across the street from the building on Le Quai de la Tournelle. When Claude Terrail passed away in June 2006, his son, Andre Terrail, took control of the La Tour D’Argent. While he has upheld all the traditions laid down over its long life, he has also introduced 21st century technology, with cameras and screens monitoring the preparation of the dishes and their progress through the kitchen and up the floors to the dining room. Even after 431 years the table looks set at La Tour D’Argent for an equally long future in fine cuisine, good wines and numbered ducks. Style, taste, elegance, chic, glamour, quality, originality, the classic cut, the perfect fit, le look francais, that petit je ne sais quoi – these are the things that bring shoppers from all over the world to Paris. The exclusive boutiques of Faubourg St Honore and Avenue Montaigne are the province of the mega-rich. 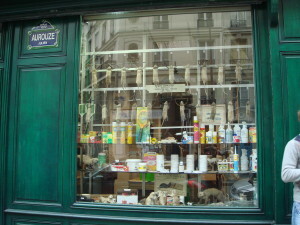 Still, there’s great sport here for ordinary folk in “la leche vitrine” – window shopping (literally, licking the windows!) or in watching poodle and parcel-toting chauffeurs trail superstars, princesses and demi-godesses from limousine to boutique and back again. Better suited to mere mortals, but still elegantly displaying the expensive but attainable treasures we covet, are the boutiques of Rue Etienne Marcel and La Place des Victoires in the Premier Arondissement, or St Germain des Pres in the Cinquieme. Better still are Les Grands Magasins or department stores. 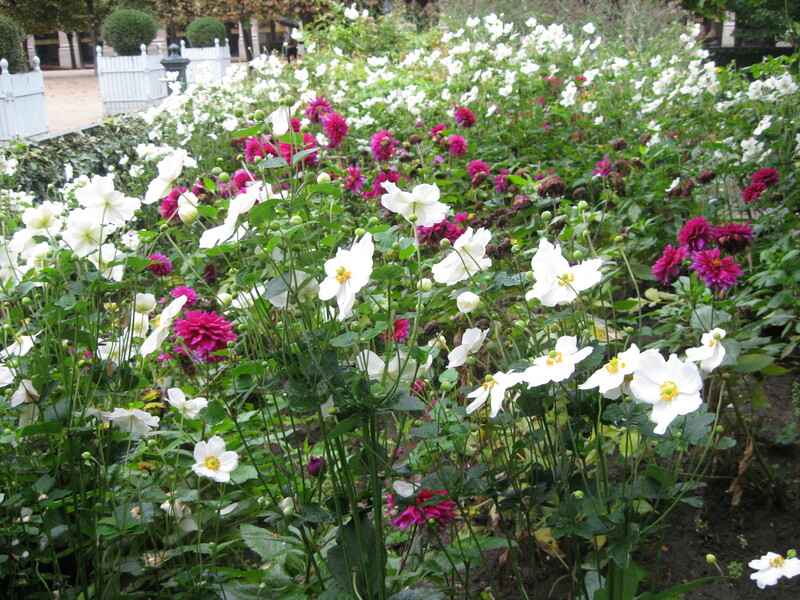 As the name suggests they are grand, in both the English and the French sense of the word. 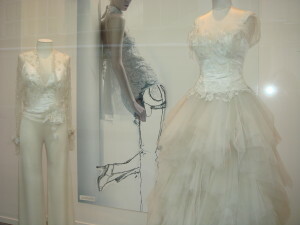 They are also chic, provide a glamorous ambience and offer everything from designer clothing to kitchen wares. On Boulevard Haussman are Printemps, and Galeries Lafayette, with its beautiful glass dome and tiers of shopping galeries which have been the inspiration for some the new world’s great stores. Bon Marche, over on the left bank is another beautiful, old Grand Magasin, with exquisite wrought iron elevator cages, curving staircases and luxurious powder rooms. 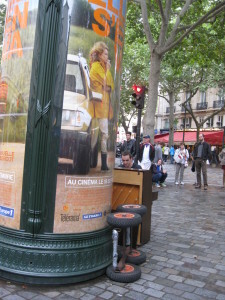 Then again, there’s Les Halles, under the site of the old Paris fruit and vege market of the same name. It is a subterranean maze of hallways, corridors, with a few French designer boutiques but mainly shops crammed with European and global labels, as well as those “throwaways” found the world over. Fast, loud and hectic, this is the place for the dedicated bargain hunter and the shopper with stamina and perseverance. The real Paris bargains and indeed treasures, lie in the markets. Most quartiers have their weekly market, mainly selling produce but also clothing, shoes, jewellery, leathergoods and even homewares, some very good and all “une vraie affaire”. The most famous and the best, however of the Paris markets is Le Marche aux Puces, or flea market, at Saint Ouen, which dates back to 1870 and is now classified as a “protected zone of urban, architectural and landscape heritage”. In its complex of thirteen covered markets, you can find everything from antiques, to bric a brac, to clothes and yes, it’s here that you’ll find that je ne sais quoi, that unexpected treasure meant just for you. The following story was published in The Australian in July, 2009. 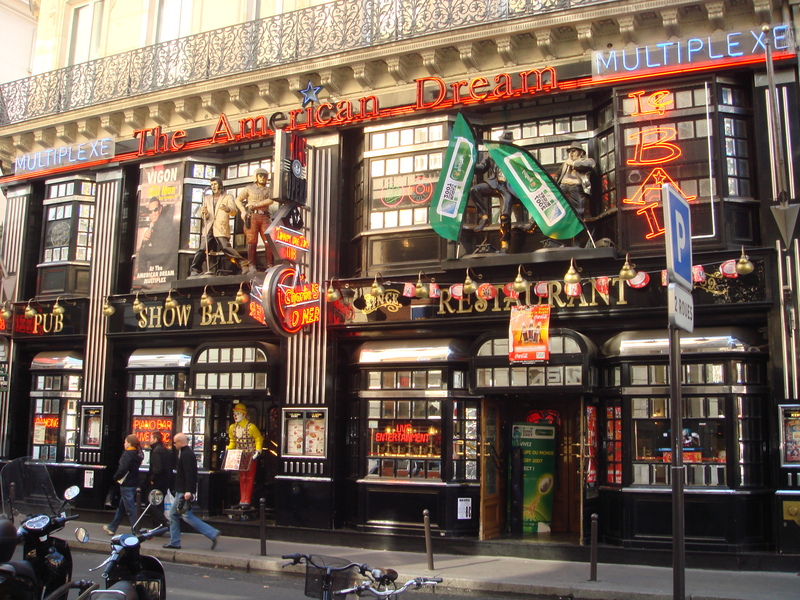 When it comes to the art of coiffure, there’s no place like Paris! I’ve always had a fear of the unknown hairdresser. It dates back to my teenage years, when a certain Monsieur Moliere (alias Gary Gallagher) of a long-forgotten, and probably long gone, Auckland Salon, high-handedly and before my dismayed eyes, turned the almost shoulder length locks I’d been nurturing for bouffant into a bowl-cut bob just hours before the school ball. Ever since, I’ve avoided the high-handed, the flamboyant and, yes, even those with French names, for the coiffeur who knows that trim means trim. While I haven’t often been surprised beyond my wildest dreams when I’ve faced the mirror at the finish, neither have I been shocked beyond belief. It was combination of desperation (vanishing colour, barbed-wire halo) and a touch of recklessness (a Parisian coiffure – pourquoi pas?) which took me to Chez Gerard on Rue de Richelieu, that Friday. Then, too there was that name – the name of the patron saint of mothers. Surely I was in good hands? Seated in one of Monsieur Gerard’s chairs was a giant strawberry bouffant (the kind I’d coveted for that school ball.) It swivelled to face me. 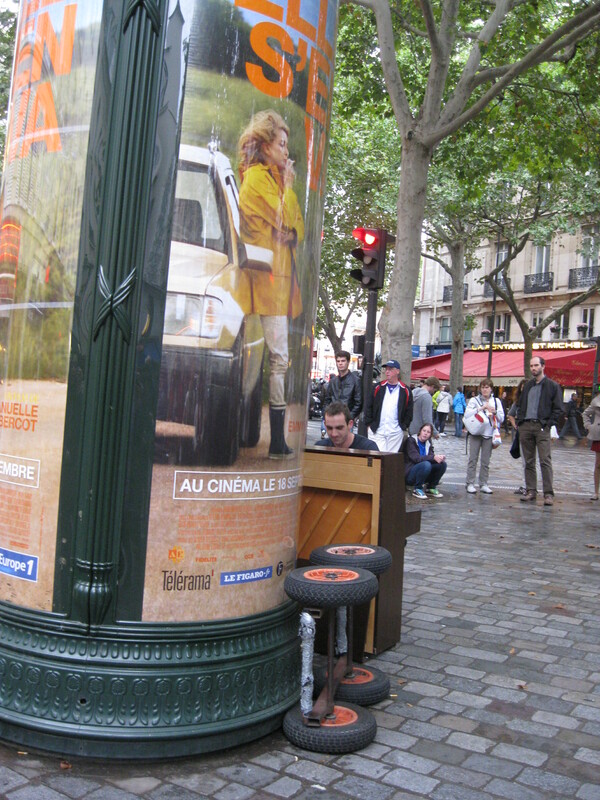 “Oui, Madame?” The voice was deep and slow with a breathy lift at the end. 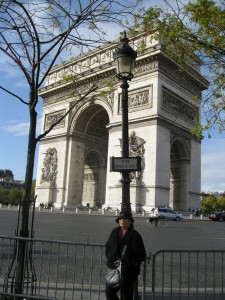 Monsieur Gerard, explained Madame, had been trapped chez lui by the Metro strike. But Madame was Monsieur Gerard’s colleague, her clients, too, were housebound, so she was free. She unpeeled from the chair and swished towards me on high black boots. Quelle chance! Quel bonheur! Madame would do my coiffure! After all she had time! As I could see, there was nobody there, she had nothing else to do! Before I could open my mouth, she had wrestled me into a plastic cape, whisked me to the basin, upended me and was plastering my head with a terrifyingly unknown dye. No time to argue, no room for protests, or instructions, Madame was deep into the story of her life and times. The story was lost in a whirlwind of hot air. Then suddenly there was silence. I looked. I gasped but I wasn’t shocked beyond belief. It wasn’t a bowl cut, nor was it a bouffant It was chic and très très français. I was surprised and delighted beyond my wildest dreams.